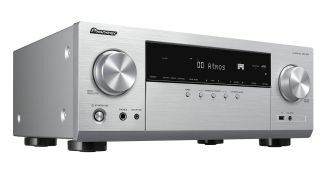 Pioneer introduces VSX-934 AV receiver with flexible Atmos support | What Hi-Fi? Pioneer is introducing a new VSX-934 AV receiver for 2019 with support for 5.2.2-channel Dolby Atmos and DTS:X speaker configurations. Unlike its predecessor, the VSX-933, the new 7.2-channel receiver will also support Dolby Atmos Height Virtualizer and DTS Virtual:X technologies (via a future firmware update), which work to create ‘virtual’ height and surround sound if there physically aren’t speakers in those positions. The VSX-934 is well equipped when it comes to network features too, with support for DTS Play-Fi, FlareConnect and 'Works with Sonos' platforms, hi-res audio up to 24-bit/192kHz and DSD 5.6, and several music streaming services including Spotify, Tidal, Amazon Music, Deezer and TuneIn radio. Bluetooth is onboard, and AirPlay 2 compatibility will also be added via a firmware update in the spring. Alongside HDMI connections (all compatible with 4K/HDR passthrough) is a MM phono input for turntable hook-ups, too. The 165-watts-per-channel receiver also supports Pioneer’s MCACC (Multi-Channel Acoustic Calibration System) for adjusting sound according to your room’s environment and speaker size and layout. The VSX-934 is priced £549.99, available in black or silver finishes, and is expected to hit shelves at the end of February.